Princess Imogene wonders whether she is as good as she should be when she reads that a princess ought to be as good as she is beautiful in The Art of Being a Princess, a gift—a hint?—from her mother. She is, and more. For moments later, when a rude frog claiming to be a prince asks her to kiss him, Imogene ignores her revulsion, puckers her lips and…turns into a frog!—a consequence he neglected to mention. Imogene will not consider putting someone else at risk, except maybe the unscrupulous actor who refuses to take Imogene home, instead making her the talking-frog star of his traveling show. 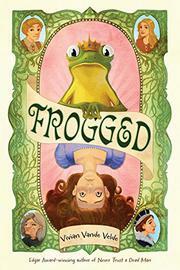 Imogene is afraid she will never be unfrogged. Uneducated, boy-crazy Luella, a member of the troupe, may be Imogene’s only hope. Readers will be quickly immersed in the story. Chuckle-worthy chapter headings torn from the aforementioned etiquette book paired with snarky commentary keep children apprised of Imogene’s status. Concise, sassy prose feels comfortably modern yet stays true to an earlier time. Characters emerge through conversations and actions, especially Luella, who, in contrast to Imogene, allows for observations about class, education and the role of women. Interestingly, it is Luella and Imogene’s mother who effect the rescue.